With the final volume The Invisible Kingdom, Grant Morrison's seven-trade opus The Invisibles draws to a close -- only I'm not sure if it's with a whimper or a bang. What's clear is that the story ends, without much ambiguity or hemming and hawing due to editorial control or last-second alterations. What's not clear is whether it all works -- as an ending, the story meanders a bit and loses sight of its larger questions, but the characters are satisfied, and we are satisfied with the characters. 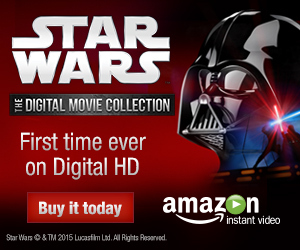 But does the ending itself satisfy? "And so we return and begin again." Rather than rejoin our Invisibles immediately, The Invisible Kingdom begins with a long look at Division X, the mystical street cops who are trying to prevent the devious plan to replace England's monarchy with the monstrous moonchild from behind the mirror. King Mob ends his brief sabbatical to fight Sir Miles Delacourt and the minions of the Outer Church, but not before bidding farewell to the Invisibles' maternal guru Edith Manning in a poignant but slightly overlong narrative thread. And when The Invisibles come face to face with the totality of the Outer Church's dastardly plot, not all of them will be coming home -- and those that do are going to be changed forever. The series concludes with a flash-forward of sorts, in which the survivors regroup in December of 2012 to take on the King-of-All-Tears one last time before budding Buddha Jack Frost ushers in the next stage of human development. If nothing else, The Invisible Kingdom more than lives up to the following one-word review (which has inadvertently become an odd tradition in these reviews), "payoff." This seventh trade brings together almost every narrative plot point in the entirety of the series, quite literally going back to the very first issue when we learned that young Dane McGowan was the next Buddha. Let's not forget that Dane began as an arrogant snot with an interest in casual arson over ontological terrorism; he's come a long way, and his story arc wraps up not in a neat bow but in a circle not unlike the all-white badge used to recruit new Invisibles to the cause, as Jack Frost does in the penultimate chapter -- the learner becoming the master. Indeed, The Invisible Kingdom is littered with closure, with every character finding a kind of peace with themselves and with their violent past. King Mob reinvents himself several times before finally finding his calling, losing a mother but regaining a lover in the process, Jack Frost embraces his role as the next Buddha in all its complexity and mystery, Sir Miles finally chooses a side, the identity of the Harlequin is revealed (sort of -- more on that later), and eagle-eyed readers will even find that Boy, who's almost entirely missing from this volume, finds her "happily ever after" by putting her violent past behind her and embracing the closure she finds in her new family. "Closure" is a major theme in The Invisible Kingdom, and nowhere is that more evident than in the most beautiful moment of the entire series, a moment which both affirms the optimism of a faith in the goodness of man and simultaneously proves that Grant Morrison is a writer who never does anything unintentionally and can find meaning in even the smallest moments -- in short, he's a genius. As King Mob lies bleeding to death in a phone book, telling his on-and-off lover Jacqui how he saved the world, he's rescued from death by the most unlikely and unexpected return of Audrey Murray. Even the most die-hard readers of the series will be forgiven for not remembering Audrey, who only appeared once before in the series in "Best Man Fall," the one-off chapter in Apocalipstick which gave life to faceless soldier Bobby Murray, murdered by King Mob back in the very first issue of Say You Want a Revolution. But character development is where this volume excels, a remarkable feat considering that this was a series which began as a "nice and smooth" action story about glamorous people who blew things up while looking cool but lacking personality; the mythology underpinning the whole thing falls just short of genius. I've compared The Invisibles to ABC's long-running Lost before, and the comparison really comes to life here. Lost began as a "What the heck is going on?" show but ended as a story more about the characters than the mysteries around them; while the show's final hours provided answers about the island and its mysteries, what was more important was that the characters found satisfaction. The same applies to The Invisible Kingdom; while we're given suggestions as to what it all means, the focus is much more on the characters who make the world rather than the rules that govern their world. Case in point -- the identity of the Harlequin is revealed when the Harlequin tell Jack not to think about midwives; Jack's satisfied with this answer and knows what he has to do to save the world, but the reader -- especially a first-time one -- can't help but scratch their heads and wonder why someone doesn't just turn around and say, "Wait, what?!" (I've read the series several times, and I'm still not sure I get it.) Unfortunately, other mysteries get the same short shrift. Remember the question about whether The Invisibles were just characters in a story into which Ragged Robin wrote herself? That's revisited here, but only to remind readers that there's no resolution to be had; instead of resolving itself, the plot point is picked at like a scab that refuses to heal. The best thing we can say about these mysteries is that Morrison doesn't just abandon them; instead he adds a little bit to each one, opening rather than closing and suggesting new possibilities or reinforcing old ones. While this is clever writing, it's a bit difficult for an ending, which should be answering more questions than it asks. Fortunately, the answers given in The Invisible Kingdom are aided by artwork which for the most part seems to know what it's doing, especially in the pages drawn by Cameron Stewart (which are mercifully redrawn for this collection from the originals by Ashley Wood, which allegedly deviated significantly from Morrison's script). While each of the foregoing six trades was governed by one or two main artists -- especially Phil Jimenez, whose detailed pencils I've praised many times -- here the series turns into an artistic jam session, such that the spine and front cover list six different artists before surrendering to an "et al" at the end of the line. Two artists -- Philip Bond (Kill Your Boyfriend) and Sean Phillips (Marvel Zombies) -- get the most face time here, their artwork resembling a madcap version of the kid-friendly Marvel Super Hero Squad by way of Jamie Hewlett. This more cartoony and slightly stubby verison of our heroes is a major departure from Jimenez's fine-tuned lines, but in a way it's exactly what the series needs as it rallies itself to challenge the apocalypse head-on. The jam session concept is pushed near to breaking near the end when the artwork seems to change faster than you can turn the page, and the purposelessness of the changes seems self-indulgent, reveling in the jam as an end in itself. When done right, multiple artists can reflect changes in a character's history (as in retrospective issues filled with flashbacks) or can indicate changing perceptions and storylines. But here the jam doesn't serve any real function, instead only adding to the confusion of the mythological wrap-up at work in the final few issues; Morrison's scripts are difficult enough, and Lord knows the last thing we need is more obfuscation. Fortunately the series ends with a chapter pencilled, as all great Morrison scripts should be, by Frank Quitely (if Jimenez is the definitive Invisibles artist, Quitely is the definitive Morrison artist). Quitely's pencils, now comfortably familiar to current readers, give the audience the feeling of going home -- appropriate, considering this final installment is a reunion of sorts for our heroes at the end of the world. And Quitely's gritty lines help show the age of the characters in the intervening twelve years, especially Lord Fanny, who's put on a bit of weight. This final chapter of Invisibles: Invisible Kingdom gives one last sense of closure, feeling like both an ending and a new beginning. Jack Frost intones, "Our sentence is up." Like the all-white badge and in full memory of Elfayed's words which began the series, we end only to begin again. In true Morrison fashion, the implication is that the world of The Invisibles is ending, but our world -- the next stage in human development -- goes on, and perhaps even reaches a new beginning now that Jack Frost and his crew have taught us how to live. And so the series concludes -- the story that Morrison wanted to tell is done, and even if there are some questions lingering I feel a little richer for having read it all. Maybe I don't fully understand what an Archon is, but I've figured out a little bit more about what it means to live as a human being at the turn of the twenty-first century. And for that spiritual rebirth I couldn't have asked for a better midwife. That's volume seven, loyal readers. We've reached the end of Grant Morrison's seven-volume opus The Invisibles, but fear not! Coming soon to Collected Editions, a bonus wrap-up review in which I'll take a look at the merits (and demerits) of the series as a whole, consider its place in the Morrison canon, and ponder why it is that The Invisibles hasn't been collected in glorious hardcover like so many of its contemporaries. Do return and begin again with us, won't you? Thanks, Zach! 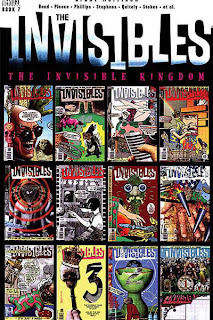 Read Zach's full Invisibles review series at the link. More reviews next week -- be here! According to some guys at the Barbelith message board (recommended reading for anyone trying to make sense of The Invisibles), who must have had access to Morrison's script, the Harlequinade was supposed to be revealed as being everyone who's ever existed, but John Ridgway didn't convey it correctly through his artwork. They should have had Cameron Stewart redraw it, just like Ashley Wood's pages. And "our sentence is up" is one of my favorite closing lines ever, up there with "sometimes I just wonder" from Alan Moore's Miracleman run. King Mob mentions several times the idea that are universe is a hologram created where two larger extra-dimensional ('extra' as in both outside and with more dimensions) meet. These are referred to in the series as universe A and B. B is the evil, hellish universe that Jack visits and where the Archons and King-of-All-Tears reside. A is never as clearly referenced as the good universe and the final issues reveal the Harlequin as coming from there. Our universe appears flat to these extra-dimensional beings and they play a game with it's inhabitants like it was a chess board. This game is the entire Invisibles series with the Invisibles and the Outer Church being the black and white pieces. The magic mirror/the thing in Roswell is akin to the Bleed from Final Crisis (both are called ultramentruum), the material that the universes are suspended in. However, I think the idea of Robin donning a fiction suit to go into her own story is a metaphor for the fact that we, humans, make our lives, our world, into stories, placing ourselves in them. At the start of the series there's a lot of mystery as new readers are eager to know who are The Invisibles fighting and the whole series draws upon the unease we feel that there are greater powers at work, and of course it's main premise is that the stories, religions, magic and conspiracies that we create to try to explain and control those powers; they are all true. Yet King Mob often questions whether they are fighting the right thing in the right way. So in the final issue, when Dane says "We made gods and jailers because we felt small and alone", Morrison seems to be saying the very opposite; that these things ARE just stories, The Invisibles never were fighting against anyone other than their own (perfectly natural, perfectly human) paranoia. I think, and this way be reaching a bit more, that he says the answer to these human problems, the paranoia, the feeling of being small and alone, is not the individualism and hedonism of The Invisibles, the 'building your little house called me', but through transcendence - the denial of self that comes from meditation, which feels like becoming one with the universe or fusing with the Supercontext. When all humanity realises this, when the 'larval consciousness' confronts and integrates the "not self", 'being a necessary stage in the development of the larva's maturing self-awareness', we will usher in the new age of the world that Dane, the Buddha, does. If I remember correctly this matches Morrison's recount in Supergods of his development from his thirties, when he altered his consciousness with drugs and experienced contact with aliens or some higher power, which he realised was just a story his mind constructed and he started looking for transcendence and altered states of consciousness without the drugs as he headed into his forties (writing The Invisibles would have stretched from his early/mid-30s into his fortieth year).